Last Sunday’s spin on the Planet-X Pro Carbon was the perfect test for my Rapha Wind Jacket. The weather was pleasantly warm, but there a decent breeze blowing and wet squally clouds threatened. A short-sleeve was likely to be too chilly and adding a light long-sleeve top could well pushed me into overheating territory, so the windjacket over my Bath Ales short-sleeved jersey seemed perfect. The Rapha is very lightweight and rolls up into a very package, so is perfect for those warm days where you’re expecting to have to discard a layer into a rear pocket and it packs up into an easily stowed handful. However, the weather turned for the worse as a cycled off the drive, with the first spots of rain, and it never improved from there. Because it’s so lightweight the Rapha jacket doesn’t offer much thermal benefit, other than keeping the wind (and some rain – see later) off, so I do need to see if there are any long-sleeve cycle jersey options with rear pockets that would work on chillier days, when short-sleeves aren’t up to the job. However, it’s weight and the effort that’s gone into the design and selection of the materials all make for a fantastically comfortable fit. I know that many people will scoff at the very notion of Rapha and it’s pricey reputation, but the design is staggering. Everyone will have tried and bought kit that was OK, but that could have been better, and will have a drawer full of kit that sort of alright and amounts to a lot of expense – if you’re in that position, take a guess at how much you’ve spent on kit and then ask yourself whether a smaller number of better quality kit might have been a wiser investment. Note, Rapha have several sales during the seasons, so it’s definitely worth getting on their mailing list and get ready to pounce when a sale is announced. Thirty minutes into my spin and the jacket was doing a perfect job of keeping the wind and light rain at bay, I was warm and comfortable, and then the heavens opened -not quite biblical rain, but not far off. This level of rain was a step too far for the jacket and the water started to permeate the sleeves, where it collected in small pools at the wrists, and the jacket started to feel clammy along the arms against bare flesh, but it was far from unbearable. As the rain slowed, the material dried quickly and it was back to business as usual for the wind jacket. Another storm fifteen minutes later soaked through the jacket, but shortly after that I was dry again. The ride was an hour and twenty minutes, and the pace was pretty quick, and at no point was I regretting the choice of short-sleeve jersey and wind jacket… A stop at Veloton and one of their wonderful double expressos would have been welcome to avoid that second storm, but it was three o’clock on a Sunday afternoon and I guess they need some time away from the shop. 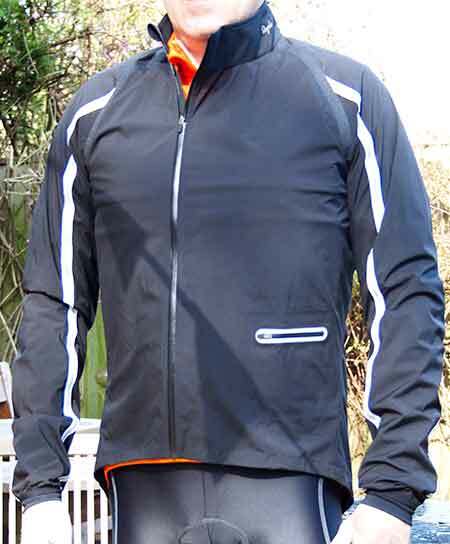 I can see myself using the Wind Jacket as my second (stowable) layer for much of the rest of spring and through the summer to cope with our changeable English weather. 12th September 2014 – I’ve been getting some early morning runs in before work, which means leaving the house around 07.00 (too early? 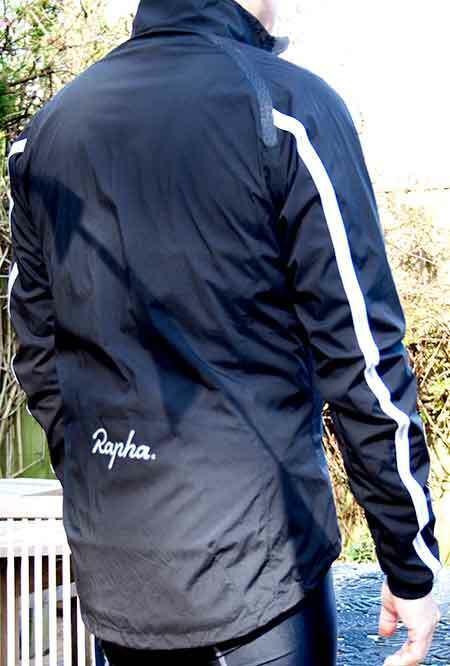 ), so I’ve been taking my Rapha Wind Jacket in a rear pocket just in case the weather turns. But up until yesterday the mornings have been warm enough for a short sleeve jersey alone… however this morning was decidedly chilly, so I put the Wind Jacket over the short sleeve from the start. It was enough to keep the initial chill off while I warmed up between Malmesbury and Tetbury. At Tetbury I was starting to overheat a tad, so the jacket came off (it’s easily stashed in a rear pocket) while I made my way to Nailsworth, up the Ladder to Minchinhampton Common, then back in Nailsworth for a spin up Horsley Hill (to see how my time compared to Michal Kwiatkowski’s Tour Of Britain ride on Wednesday). As I came off the top of Horsley Hill a breeze kicked in across the Avon escarpment and that, combined with a flat road and fine mist, was enough to bring my temperature down really quickly… so the Wind Jacket went back on. It stayed on for the remainder of the ride back in Malmesbury, not too hot, not too cold. So I feel as though I’m getting the hang of this cycle layering lark, and the Wind Jacket is still proving to be an ideal part of that ‘system’. Update – 11th Nov 2014 – We’re tracking into winter now, albeit slowly, but the Wind Jacket is still proving to be excellent. On Sunday I went out early (08.00) wearing a long sleeve merino baselayer and my Country Jersey over the top. The rain had stopped, but it was a damp misty morning, and I’d hoped to get some warmth in me fairly quickly. But the chill set instead, so the Wind Jacket went on and stayed on for an hour and a half, by which time the sun had come out and the mroning was glorious for cycling. It wasn’t the hardest of rides as I was with a mate who’d just taken delivery of his first road bike for twenty or so years, but the Wind Jacket meant I didn’t get cold and was able to enjoy a really pleasant spin in the autumn mist. Previous PostBianchi Oltre XR.2 – £15,000 dream bike? Next PostWhy your LBS is vital.